Sheila Green Productions is a one-stop, turn-key video production company. It primarily consists of Barry Mills and a number of talented individuals who may be pulled in to complete a given task. 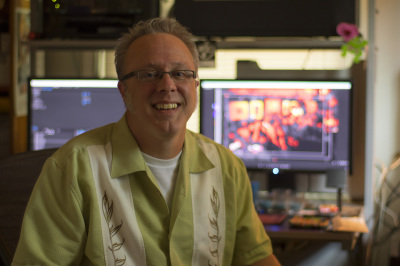 Barry liked to make super-8 films as a young lad and has continued his craft well into the video and digital age. He has written and produced a number of shows for TNT and Cartoon Network including The Rudy and GoGo World Famous Cartoon Show, The Popeye Show, The Bob Clampett Show and Space Ghost Coast to Coast. He has written, produced, directed and edited promos, commercials, teasers and trailers for TBS, TNT, Cartoon Network, Adult Swim, Nickelodeon and TruTV among others. He also created, co-wrote, directed, edited and produced the short film Fun World as well as The Mekon's Mekonception video - part of the Mekons Existentialism CD/Book/Video release. Barry Mills grew up in Pine Mountain, Georgia. In 1986 he moved to Atlanta and began working in the shipping department at Turner Broadcasting while video taping bands as a hobby. In the next year or so Barry befriended punk rock legends the mekons, eventually gaining deputy mekon status while documenting the band at the same time. He also started Atlanta’s first underground hip-hop radio show, WRFG’s Macadocious in Effect, which featured a host of guest DJs including the debut of up and coming rap superstar Li’l Jon. During this time Barry began working in the operations department of Superstation WTBS. In March ’90 he moved over to on-air promotions for Turner Network Television. In February ’94, he took a break from TNT to tour with the mekons and do some freelance video work. In November ’94 Barry joined the on-air promotions department of Superstation TBS. There he struck up a friendship with writer Jack Pendarvis, who would join him in co-writing and producing The Rudy and GoGo World Famous Cartoon Show. The Rudy and GoGo Show premiered in July ’95, not on TBS but TNT. During this time Barry and Jack also formed rock band the li’l flames. Rudy and GoGo ran through September ’97, then Barry joined Cartoon Network’s program development and the Space Ghost: Coast to Coast team in January ’98. Around this time Barry formed the Donnell Hubbard band with long-time friend and co-worker Matt Maiellaro. He also wrote and produced The Bob Clampett Show and The Popeye Show for Cartoon Network. In October ’03, after a brief stint at [adult swim], Barry left Cartoon Network and began Sheila Green Productions, LLC. Barry is married to the lovely Julie Mills and they have co-produced a lovely daughter as well as the short film Fun World.